If trees could talk, oh what many stories they would share. Left out in the open, they are vulnerable to the elements. This particular tree is in the backyard of my parents’ home in Miami, Florida, so the elements to which it is exposed range from almost scorching heat, to hurricane winds and rain, to very cold temperatures. Not only that, but trees also have to deal with winged and four-legged creatures of all kinds getting into their space. And without an invitation, of course. While these invaders stand to benefit from such encounters; for example, they find rest, shade, nourishment, even a place to relieve themselves, I am not certain the trees would be rejoicing about these interferences. Then there are the human elements who make themselves known. Also unbidden, they impose their desires, whether as farmers or other caretakers, climbers, pickers, or stoners, much, I am sure, to the vexation of these trees, if only they could talk. But then, there are also admirers, which is the category I found myself in when I happened upon this tree. I found it very interesting that this humungous tree stump which I am sure in its former life was majestic, towering over all the other life forms, spreading its fronds in all directions, is almost dead. Now, it is hollow sounding, the roots barely hanging on to the earth, and at some point its head was completely severed. Yes, it’s almost dead. Still a great structure in size, my eyes traveled up the barky exterior to discover a suspicious-looking hole near the top. My mother tells me that a woodpecker’s bill is responsible for the hole. So, the tree is now home to a family of woodpeckers after “Woody” staked this tree as his territory. I was hoping that I would have had an opportunity to see any member of the family, but unfortunately, I didn’t. I continued the tour of the tree and almost keeled over when I saw the evidence of new life peaking out from the top. About two feet in height, a very slender, spindly but leafy plant is growing out of the stump. A tree on top of the tree! In spite of everything going on with this tree, it’s still holding on for dear life! What resilience! As I stood and looked at this magnificent structure, I couldn’t help but think how wonderful God is. His splendor is evident through His creation. Wherever you are reading this, just look around (peak through the window if you’re indoors) and you won’t help but see God’s magnificence. The sky, the clouds, the stars in the sky, the hills, trees, other people, everything was created by God. As a reminder or confirmation of the above, I urge you to search the scriptures, starting with the following: Genesis 1:1; Psalm 19:1; Psalm 102:25; and Colossians 1:16-17. 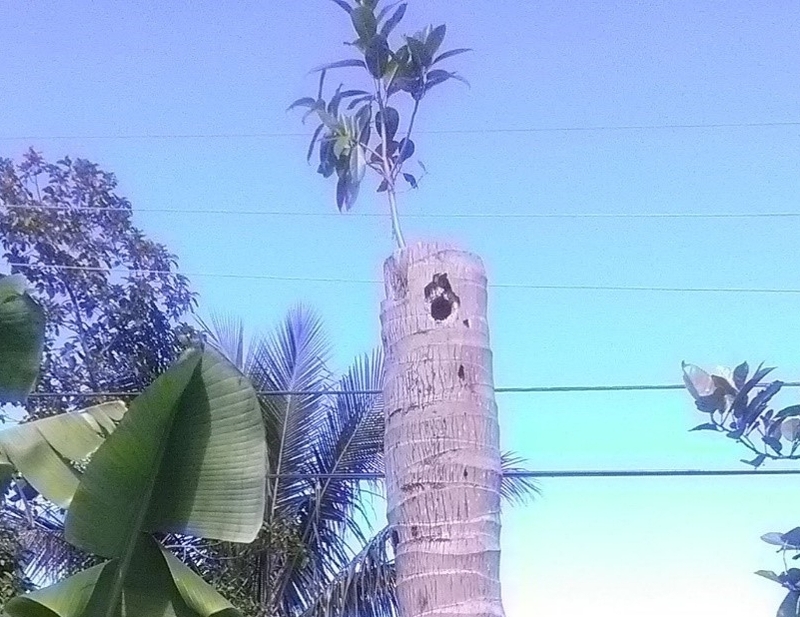 Speaking of the tree that stands in my mom’s backyard, it reminds me of the scripture found in Isaiah 11:1 which says, “A shoot will come up from the stump of Jesse; from his roots a Branch will bear fruit.” To me, this new “shoot” in my mother’s garden is also indicative of the Messiah who is coming again. The One who went to the cross for you and me. He endured unspeakable atrocities, even died, yet now lives strong and is planning His return even now. The shoot stands resolute – a reminder to get ready.